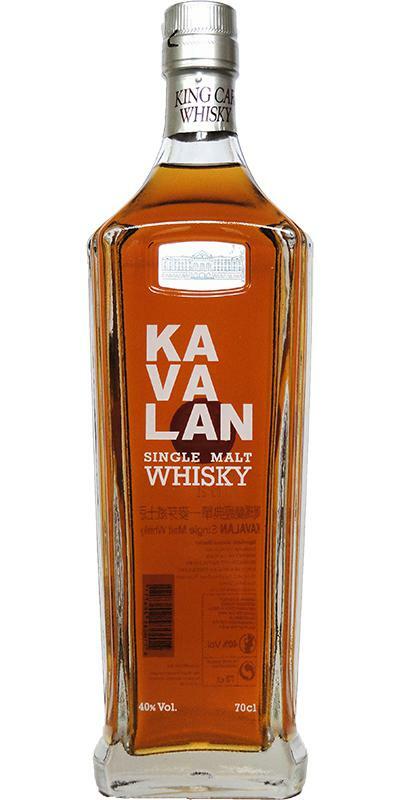 From the award-winning distillery in Taiwan, Kavalan Single Malt is their entry-level bottling. Being matured in six different cask types, the nose is reminiscent of a quality Blended Scotch. Very fruity with ripe oranges, mango and pineapple at first, the aroma turns more floral and honeyed upon adding a little water. Werther's Original drops, maple syrup and measured oak influence characterize the rather simple taste of this young malt. The finish is quick, chocolaty and slightly bitter. An interesting but very 'engineered' whisky with a hefty price tag. The aroma of chocolate sweets with liqueur, candy, caramel, toffee, vanilla, mango, some flowers. The taste echoes the nose almost one to one, adding more fruit and candy. The finish is short and poor, young, bitter chocolate and astringent tannins. Very surprised nose and taste. For a basic NAS is very good and rich. The finish is almost completely absent, leaving the bitterness of wood, very slightly knit mouth. When a small fortress is drunk quite heavy, most likely because of the "thick" astringent taste. For the money for which it is sold, and you can take, since the profile of the whisky is still not quite standard. Compared to the cask strength (and preferably sherry barrel matured) Kavalan's which I am a big fan of, it still stands out against me. In any case, the 40% really makes this whisky too weak, had at least 46% liked. Smell is still promising, but especially body does not make it true. Fruity, apples, citrus, orange. Sweet too, honey. Tropical fruit, specifically mango and pineapple. Fruity, somewhat flat, orange, honey, somewhat stimulating but also a somewhat watery mouthfeel. Pretty short, fruit, slightly tingling, slightly warming now, honey, vanilla and peach. Shows real promise, just a shame its 40%. Not a complex whisky, but a very pleasant one and good to start an evening with. It won't stand up against more complex malts. Sweet fruit, mixed fruit, vanilla, water opens up even more fruit. Creamy. Pear drops, but not overly sweet, gentle oak, a little chocolate (light/milk), very light note of liquorice. Light, rounded and very pleasant. The nose saves from total failure. Chemically, bitter. Not for long, but too long. The Bourbon barrel makes itself felt. A lot of vanilla. Even fruits are available. I also like the honey. The fruits become stronger with time. The mango is clear now. The oak is noticeable. Spicy and vanilla. And: the mango is very clear. The spice is strong. Light menthol note. The finale is a bit oak. Tastes more like a bourbon - I'm not yet convinced by this one as their are plenty of bottles which provide better value for money.